Mobisante’s new portable ultrasound USB device has had to jump through countless FDA imposed hoops in order to become a marketable reality. This little wonder is a portable, wireless device that is meant to be used in a variety of imaging applications, including fetal ultrasounds, peripheral vessel imaging, cardiac ultrasounds and so on. This highly anticipated smartphone ultrasound underwent a couple of years of testing, followed by a few months of Mobisante implementing the required governmental changes. Now, there is just one little problem. Mobile health is a quickly growing technological industry. Some even estimate that it could potentially be a two billion dollar market. As one would imagine, the market is poised to create revolutionary mobile devices that would benefit technological manufacturers, regular people seeking healthcare and small healthcare providers. Here, we introduce the Catch-22: technology is moving at warp speeds of light while the FDA is moving somewhere akin to a snail’s pace. In short, by the time the FDA approved the MobiUS ultrasound device, it was no longer compatible with much of the technology that is now widely used. It is made to work specifically with the now two-year-old Windows Mobile 6.5-based Toshiba TG01 smart phone, and also uses a USB 2.0 probe. This makes the device completely incompatible with tablets and Androids. This is such a problem that the device actually now ships with the phone that it is intended to be used with. With a price tag of $7,495, the device is actually one of the least expensive ultrasound alternatives. Traditional ultrasound systems cost upwards of $100,000. 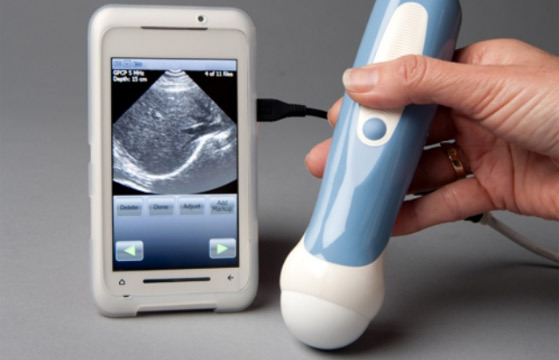 There are other mobile ultrasound devices similar to the MobiUS USB ultrasound, but none with a wireless handheld device. As a result, the MobiUS is ideal and affordable to smaller medical practices as well as mobile clinics. The FDA does recognize that there is a problem in the speed at which they are able to test these new mobile health devices. However, all parties who are involved in the process seem to have safety at the top of the pecking order. There is set to be a major overhaul of the system next year, but until then it seems we’ll just have to keep waiting. Thoughts? Weigh in below on the role of USB in the mobile healthcare industry. This entry was posted in Articles, MobiUS, MobiUS Ultrasound, USB Devices, USB Gadgets, USB Technology and tagged Do-It-Yourself USB Ultrasound, mobile healthcare industry, Mobisante MobiUS smartphone ultrasound, MobiUS, MobiUS SP1 ultrasound, MobiUS ultrasound device, Mobius Ultrasound USB Smartphone, Portable USB Ultrasound, Smartphone ultrasound device, USB Ultrasound. Bookmark the permalink.